The Apple Watch has been around for about a year now, and app developers haven't spent all that time with their heads under their pillows. Indeed, one of the most engaging things you can do with it is playing the fun and addictive micro-games available for the platform. The challenges of mini-screen wrist gaming have challenged developers to come up with particularly clever ideas about game design, and thankfully, the game industry isn't one to lack bright minds! The five games in this selection will get you spending plenty of quality time with your wearable, and with your iPhone, actually. 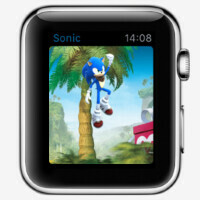 Some of them are made for the iPhone but have companion apps on the Apple Watch that double as mini-games, of sorts. Others are designed for the Apple tick-tocker from the ground-up. Whatever the case, we're pretty sure you won't be disappointed. This is a great beginning for wrist-borne gaming! Sonic Dash will treat fans to the cast and world of the Sonic Boom TV series. The game itself is played on the iPhone, but there's an Apple Watch companion app to earn in-game rewards by solving various challenges! The companion app requires watchOS 2 and needs access to your Health Data on the Apple Watch. As for the main game, it features new 3D worlds and challenges. It lets you play as Sonic the Hedgehog, Tails, Amy, Knuckles, Sticks, and Shadow. You can race with up to three characters, unleash awesome special powers, conquer new obstacles, level up and compete with players from around the world in leaderboards, and have a generally great Sonic time! This app is just like the original Tamagotchis that we used to look after in the nighties. It comes with two gameplay modes – Toy Mode, which recreates the original Tamagotchi devices with their monochrome screens and pixel graphics, and a full-color App Mode with touch-screen controls. You can switch between the two modes whenever you feel like it! The Apple Watch app lets you check your Tamagotchi's status and take care of it right – you know, feed it or put it to sleep or whatever – on that tiny screen. If your Tamagotchi calls you, it will show up on the Apple Watch too, so you'll never miss a beat with your little pet friend. Best Friends is an adorable puzzle game in which you handle the cute little creatures of Minutia. They used to live in peace and harmony, until a meteor smashed into the nearby mountain and a strange force transformed the slimy slugs who lived there into a bunch of no goods. You have to fight back against the Slugs, growing and leveling up your creatures, developing their special powers, and having plenty of fun along the way! Best Fiends on the Apple Watch is a separate game experience in which the mischievous Temper embarks on a journey through the land of Minutia, visiting new locations and finding lost treasures… All the loot you find in the Apple Watch app gets transported to your iPhone from the Watch. Spy_Watch turns your Apple Watch into a special operative's pager. Designed specifically for the wearable, the game is played via notifications, which is clever and certainly not as annoying as it may sound! You get to be the head of your own spy agency, playing missions in real time as the game "inserts" itself into your everyday doings with encoded messages that ask you to direct your agent in critical points of the mission. Via that tiny screen, you will accomplish all sorts of enemy assassinations, uncovering secrets, spy seduction and base infiltration. Try it for yourself before this message self-destructs! This is another cute puzzler, one which will challenge you to a fast-paced memory test. The game has three levels of difficulty and smoothly progresses in complexity the more you play it, so it can potentially keep you busy for a long time. The game features adorable fantasy creatures – whales, unicorns, robots, and squirrels. It's got a nicely polished interface and a color perception assistance mode in case you're having trouble getting through some levels. With plenty of surprising new game mechanics and an army of creatures too cute for words, Rules! is considered "must have" among Apple Watch gamers. Apr 15, 2016, 6:03 AM, by Luis D.
Apr 15, 2016, 2:47 AM, by Alan F.
Why did anyone play tamagotchi giga pet? Don't forget early phones had similar screens, lower resolution, and even no colors - and we all played games on them. This is just a time waster. "time waster" - how about using your smartphone? Most games I've found on smartphones are also a waste of time. I waited 5 years for Tablet tech to mature to a device worth having, and it looks like I'll be waiting just as long for smart watch tech to mature. Silly games certainly aren't selling me on the idea of goofing around with a tiny square screen. It's not for everyone. But try AfterPulse, and Real Racing 3. Pretty completing games that got me hooked and won't let go. See, I prefer games that are more simulator than smash, bang, fly thru it. Real racing is so much better on devices with gyro sensors than playing racing games on PC (I don't care to own consoles or steering wheel). And AfterPulse is just freaken awesome - graphics are outstanding. Got a 5 star a500 now and I'm killing in it. I agree with you to some point. The only major problem here is Apple Watch's horrible battery life. I was thinking the same thing. But then I remember back in the 80's, I played with game watches. It was cool as I had a Pac-Man one. But it was a chore. I did try this cool race car game on my GS2 that looks like Outrun, but the screen is just to tiny. I also tried a Blackjack and slots machine. Not even worth the time and effort to install. Other than reading notifications, these tine screens just aren't good for anything more. Even sending a text is a chore on the S2 vs my S. The S has a full QWERTY keyboard. I dont see them being anymore useful than they already are. Their size is a limitation within itself. These games will never be on AW because manufacturers are moving to round displays. Goes to show Apple had the right choice choosing a square shape. I was confused for a second because "AW" can also stand for Apple Watch, not just Android Wear. I disagree though games can easily be optimized for round watch. With its own interface. Android hardware is just too varied and they don't sell well enough YET for devs to explore the android wear market as they do WatchOS. Samsung watches will work with iOS - do the sales should pick up for android - and devs will see a green light to move in.